Do you have what it takes to participate in Business challenges organized by top schools and companies seeking to gather the best MBA students in order to develop the best solutions to their different case studies? If you emerge as the best of the best, you will be awarded substantial prizes. 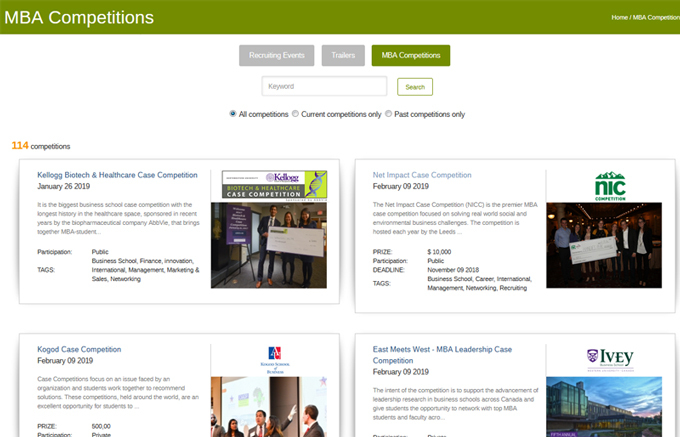 Our MBA competitions directory has now been updated with over 110 competitions for MBA students interested in showing their worth. We have lots of competitions sponsored by top companies across a vast collection of industries so you can prove yourself in the field where your passion lies. We have case competitions designed to identify student who have what it takes to develop and recommend solutions to industry issues. These competitions are held all over the world by various organizations globally, internationally and locally. Students can go through the directory to search for the case competition that best suits them. Organizers of the case competition will provide participants with a case which the participants have to prepare a presentation based on the information in the case within an allotted period of time. Each case competition has a price attached to it and is usually open to MBA students and teams. The range of topics chosen over the years is considerably vast, from financial applications to medical cases. The organizers will then go through all submissions from all participants in order to select the best solution to the case. The participant(s) with the best solution will be awarded the first price which ranges from $500 to over $40,000. The runner ups may also be awarded a price depending on the terms of each individual case competition. Each case competition has its own unique rules as well as its own prize and field of relevance. The field of relevance is usually related to the organizing company’s industry. Where a major pharmaceutical company may focus on healthcare solutions, a finance company will have its case providing a solution to analytics and other financial applications. Each case competition was designed to not only solve specific issues, but to look for the best possible method to solve those issues. The aim of these case competitions is to solve strategic challenges and managerial problems that business leaders face all over the world and discover top talent while at it. Competitions may be open to all MBA students or private in that the competition is open only to candidates from selected schools. However, whatever the case may be, our directory contains a wide array of choices which will suite any unique considerations you might have. Note that most of the competitions will run during the first trimester of the year. So it is important to enroll for your preferred case competition as soon as possible.